I visited several times and have always been greeted by kind and caring staff members. Most of the residents seem happy! They do a great job with events there as well. Great management team that cares about the residents. Residents are happy and in a safe environment. The place is clean, very good staffing levels and the food is nice too! This facility is unprofessional, unorganized, practice out of scope, high turn over rate, and serve food pass the expiration date. They have med location technicians that practice without proper licensure. The management has no remorse for employees or residents. The employees argue and bicker during meal servings. Do not trust your family member in the hands of this organization. I have witnessed employee sexual harassment in sight of families. The best way to get to know a community is by scheduling a tour. See the facilities, meet the staff and residents, and get a feel first hand what it's like to live at Insignia of Sandy Springs Assisted Living. When loved ones require assisted living or memory care, families can turn to the distinctive, boutique-styled community Insignia of Sandy Springs. We offer a full suite of services to help seniors remain active and independent. When residents join our community, they are pleasantly surprised to find themselves feeling like part of a family. Our location is near plenty of shopping and healthcare services so our residents don't have to travel far for outings or doctor's appointments. Insignia of Sandy Springs is a family-owned and operated senior living provider in Atlanta, Georgia. We take a hands-on approach when it comes to caring for our residents, and because many of our staff are long tenured, we have a low staff turnover which provides valuable continuity and higher quality of care. Our suites are spacious studios and one-bedroom floor plans which have all the comforts of home, such as wall-to-wall carpeting, a closet and a large picture window that overlooks our scenic grounds. The one-bedroom suites include a full kitchen, while a kitchenette is available in the studios. 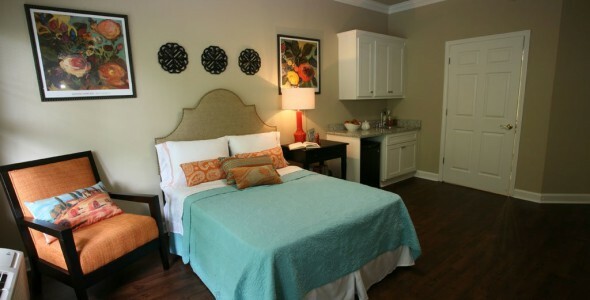 We encourage families and residents to bring personal furnishings to make the space feel like theirs. All the suites have an emergency call system so help is always close by. Throughout the day residents are found participating in engaging activities. Whether it's arts and crafts, a painting class or a daytime outing, we always make sure there is something to do. Our community also features a welcoming library and common areas that are perfect for meeting with friends or family. At Insignia of Sandy Springs families will find all the services their loved one needs. Our chef prepares delicious meals that are served in the inviting community dining room. There is also a bistro where light snacks and refreshments are always available. We also provide housekeeping, laundry services and scheduled transportation. Whether it is assisted living care or memory care, our highly qualified staff can fulfill any healthcare needs. Around-the-clock staff are always available for when residents require a helping hand. We offer health and wellness programs so our residents can remain healthy and active. When your loved one joins Insignia at Sandy Springs, they will be treated like family.